The AU Museum exhibit "Estate Art of H. Marc Moyens" will close this Saturday Sept. 20 for Fall for the Arts. The day of art classes, spontaneous performances and fun for the whole family ends with an auction of art from Moyens' collection. As Moyens' collection grew, he opened his own gallery, Gallery Marc in 1969. Six years later, he joined forces with Komei Wachi to open Gallery K. Besides the great European works in the collection, Moyens also bought the works of important Washington artists represented in the auction, artists like Ed Bisese, James Bumgardner, “Big Al” Carter, Pat Craig, Betsy Falk, Ruby McLain Grady, Robert Hynes, Alfred McAdams, Jody Mussoff, Franklin White, and Washington ex-pats John Harne and Alan Stone. There are also examples of American Folk Art, and Latin-American and Southwestern landscape painting of extremely high quality. Moyens and Wachi both passed away in 2003. Fall for the Arts is a fundraiser, and all proceeds benefit the arts at AU. Tickets are $25 and $10 for students and those under 18. For workshop schedules, online tickets, and auction information, visit the Fall for the Arts website here. See the auction items and then and bid here. 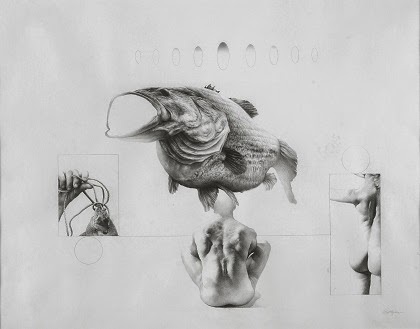 Graphite on paper, 23 x 27 in.